Outer part of the air control valve on the inlet manifold on MPi Minis. Special order. Restore lost performance with a new SU HS2 (1.25") single carb to replace original one used on 850 and 998 Minis. Equipped with floating needle. 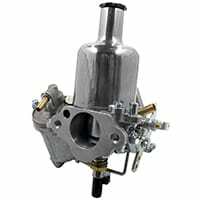 New SU HS4 (1.5") single carb to replace original one used at various times on late 850 and 998, 1300cc Minis and Austin America. Diagonal bolt pattern, standard plastic jet. 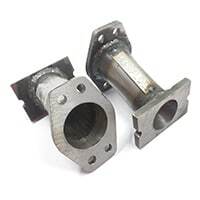 Reproduction idle air control valve (IACV) that bolts on the side of the injection body housing to control engine idle speed and air flow from cold start up. 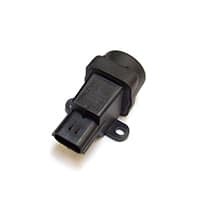 Electrically controlled inertial fuel cut off switch for SPi and MPi Mini. 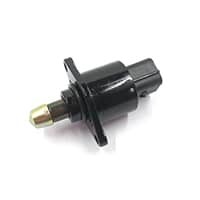 Detects sudden deceleration and stops the flow of fuel to the engine. Fabricated inlet manifold for twin SU HS2 carbs. 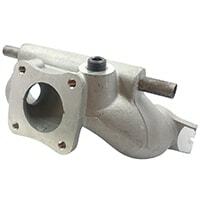 This manifold gives a useful 3-5 HP performance increase over the cast aluminum manifolds. 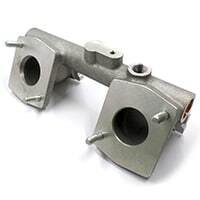 A quality Maniflow product, made in U.K.
Special fabricated inlet manifold for twin H4, HS4 or HIF4/38 carbs. 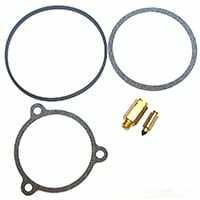 Bore is 1.5" at the carb flange. 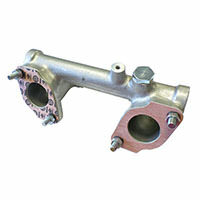 This manifold gives a useful performance increase over the cast aluminum manifolds. 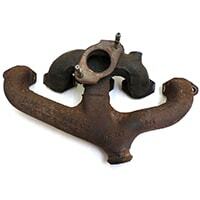 One piece cast iron intake and exhaust manifold for use with single SU HS4 carburetor. Used condition. 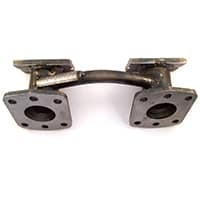 3.5" long intake manifold for Weber 40 or 45DCOE. 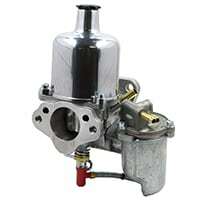 Allows for Weber carb installation without modifying your Mini's firewall. 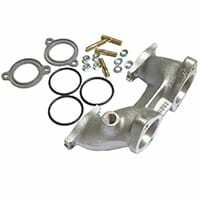 Aluminum intake manifold kit for 45DCOE Weber. Developed for competition use. 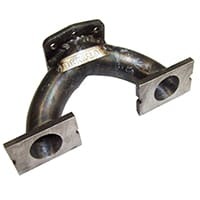 5" long intake manifold for Weber 40 or 45DCOE. Maniflow’s tubular steel manifolds out-perform the aluminum versions! 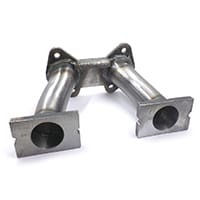 Aluminum inlet manifold to fit twin 1.5" HS4 SU carburetters onto the Mini. Made by SU to the original specifications. 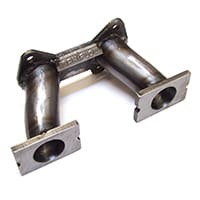 Fabricated steel inlet manifolds for Weber carburetors. 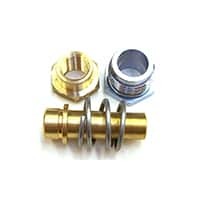 These are made by Maniflow and are specifically designed for right-hand drive installations. Sold as a pair. 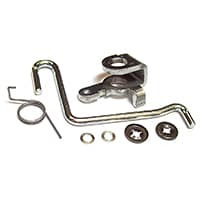 Blanking plate to cover the intake and exhaust ports on your spare engine during transport. 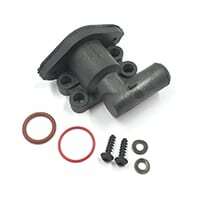 This improved rubber fuel pump isolator replaces the earlier foam type. 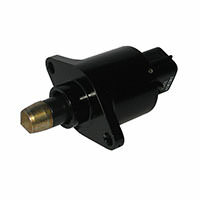 It reduces vibration which can shorten the life of the pump. 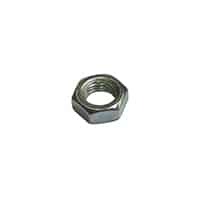 Half-height 3/8" SAE nut for use on rear brake hoses, bonnet pin, and twin HS2 intake manifolds. 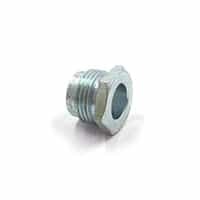 Special large-bore jet for racing applications. 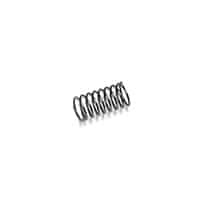 Has .100" bore instead of conventional .090" bore to allow richer mixture. 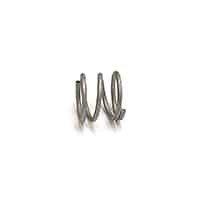 Fits forward or left-hand carb. 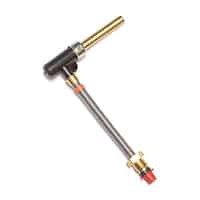 Special large-bore jet for racing applications. 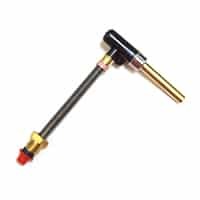 Has .100" bore instead of conventional .090" bore to allow richer mixture. 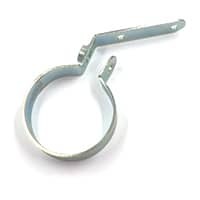 Fits aft or right-hand carb. 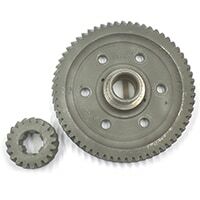 Linkage set for converting a later Waxstat type jet HS4 to the earlier, simpler plastic fixed jet. 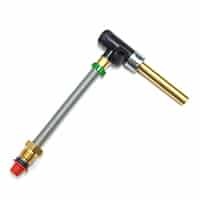 Jet tube assembly for HS series carbs with plastic jet. 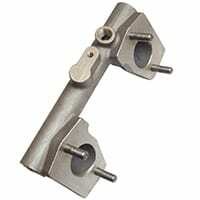 This fits the front carb (radiator end) on twin carb installations. 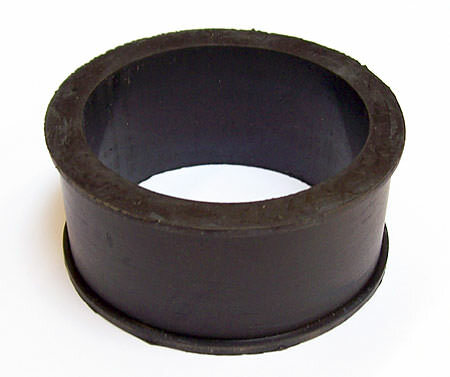 Green band designation; bore size .090". Jet tube assembly .100", white color ID, HIF6/44. The .100" jets are identified by a groove cut into the top end. 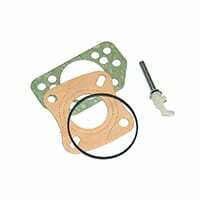 Replacement for the troublesome seal seal in the bottom of the float bowl on HS (side float) carburetors. 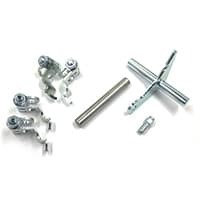 Used assembly required to convert 1989-2000 Minis from right-hand drive to left-hand drive. 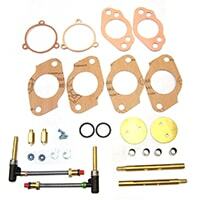 Linkage kit for twin HS2 carbs on Mini, Sprite or Midget. 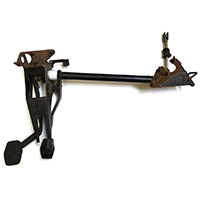 Includes 12A0310 original center rod with balance bar. 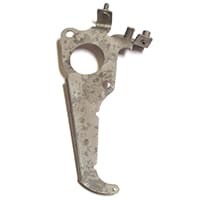 Used abutment plate for single HS4 carburetor. 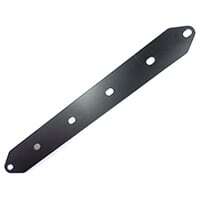 This plate has the mounting stud for the original air filter and also locates the throttle and choke cables. 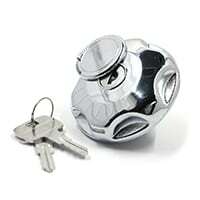 This stylish locking vented gas cap is modeled after the caps found on more expensive classic cars. As shown, the key slot is concealed by a swingdoor.Stainless steel. 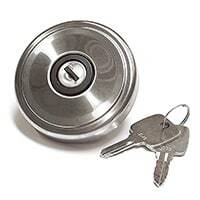 Locking fuel cap with keys from Rover's original supplier. 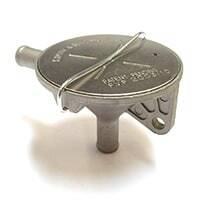 Modern-looking vented cap secures your gas from theft. 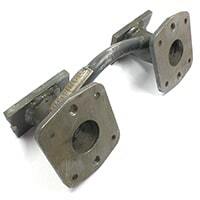 Fuel pump mounting bracket for the classic Mini Moke. 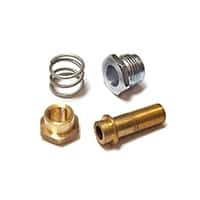 Jet locking nut for SU HS-type carburetor, as included in jet bearing kits WZX1442 and WZX1341. Sold each. 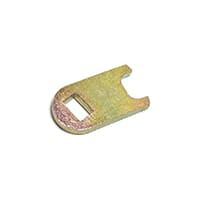 Original Misab mounting plate for side draft 40, 45, or 48 DCOE Weber. 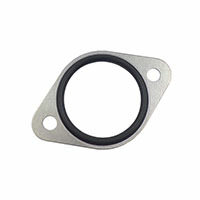 The integral rubber o-ring helps prevent vibration and fuel frothing. Two (2) required; sold each. 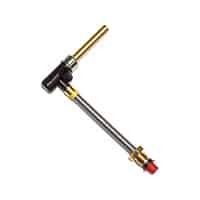 This valve is needed on most nearly all twin carb models such as MG midget, MGB and of course Cooper S models to pass emissions control tests, but a properly operating valve has no adverse effect on performance, but may improve it. 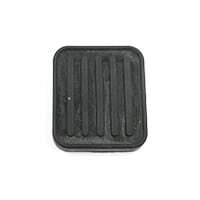 Rectangular rubber pedal pad fits brake and clutch pedals to 1975, and throttle pedal from 1976-on. Black.